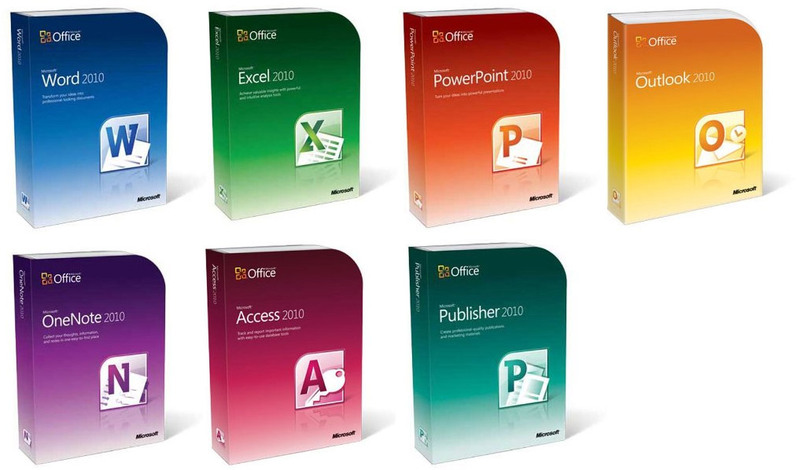 With the global business launch of Microsoft’s elusively-impressive Office 2010 productivity suite today, Amazon.com has unleashed the box arts for each of the individual (fourteen) Office standalone applications (Word, Excel, etc.) to satisfy your product packaging-fetishes. In stark contrast to the previous box art, the new packaging takes on the recent trend of simplification in Microsoft box arts to a whole new level with a design that boils down to just a gradient, the name of the product and the icon. In fact the only functionally-unnecessary element in the whole design is the reflection of the icon. As simple and colorful as they may seem, it actually looks pretty cool. Hey, Amazon also has shots of the back of the boxes … click the second picture on each product’s page on Amazon. Picture quality isn’t great so you can’t read everything on the back of the box, but still cool to see what they’re emphasizing for each product. Looking good. Some say the box doesn’t matter or say download is the way to do and they are right to a point. But this is 2010 and the days of boring old cardboard boxes are over. Friends don’t let friends use Publisher. Friends don’t let friends spend US $700 on a professional DTP Package such as Quark or InDesign when all they are creating are church newsletters, flyer’s and basic websites. Don’t dis the product if you have never used it or just opened it once. Fail with use of three shaes of green, and two shades each of red, blue and orange. And using P for PowerPoint, Project and Publisher. Have they run out of colors and why don’t they use Adobe-style two letter initials? Po? Pu? Pr? Word and Visio boxes look almost the same. Generally, I like it. 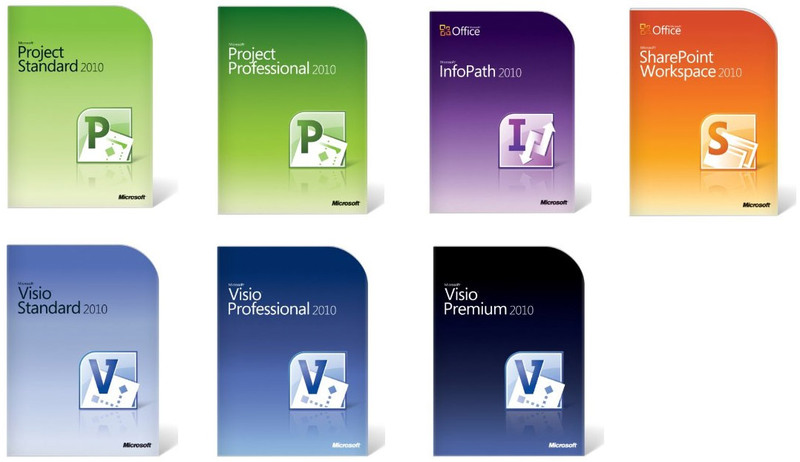 I’m curious though, why Project and Visio do not have the Office logo on the top left. That’s actually because they’re not officially part of the Office suite. For example it’s Microsoft Project 2010 and Microsoft Visio 2010. Well, note that *every* suite product is back to being marketed without the “Office” — Microsoft Word 2010, Microsoft Outlook 2010, etc. I’ve noticed this in the beta, and it appears to be carrying over to the packaging branding. I like it. And I like the packaging in general, although yeah, it matters less these days, and, “someone,” it’s not quite as lovely as Adobe’s approach (which I adore). Actually it has nothing to do with it being a part of the Office suite. Products like Project, Visio are low volume products in comparison to Word, Excel and Outlook. Although Project and Visio are popular in their own right, they are not as heavily used as the products in the suite, so the packaging doesn’t have much priority in design. So its primarily to save cost. The Powerpoint, Publisher and Project looks confusing because of the P if you don’t read the word above. How about the color boxes of Publisher and Project? The boxes are in the shades of green. Boxes make branding consistent — and you’ll instantly get familiarized with the Start Menu/Taskbar Icon, too! The only thing that may become an issue, is that one day, most App Icons will be based on letters. Like Adobe app icons. So later we can get confused with a Start Menu resembling the Periodic Table of Elements. Back to basics. These boxes are HOT.